Specifications: Comes in a 5g (0.175oz) tube, which should be enough for 8 to 10 screen cleans, depending upon how much you use. Note: this product is only for use on non-coated surfaces and plastics (i.e. the transparent part of the screen. Do not use on the painted portion. The product is non-returnable. Very gentle abrasive, so unlikely to do damage to the screen on most applications. Probably won't remove deeper scratches. Getting scratches in your screen display is always annoying -- especially when you remind yourself that you had meant to get that screen protector installed, but never got around to it. There are numerous 'old wives tales' about using toothpaste, etc. to remove scratches, but it's definitely better to use a product that is specifically designed for the job. 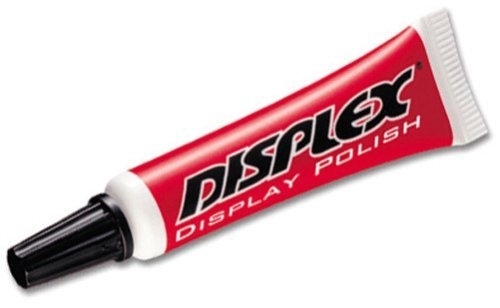 Displex, from WirelessGround, is sold as a display polish. But how good is it at taking out scratches? Let's take a look. In my work here with Windows Phone Thoughts (and just in general with my passion for cellular technology), I tend to go through a lot of phones, and typically when a new one arrives, the old one either goes into a drawer somewhere, goes onto eBay (if it's not too old) or gets handed down to one of my teenage sons. In the case of my AT&T Fuze (aka the HTC Touch Pro), my 14-year old recently discovered texting and was looking for something with a keyboard to replace the Touch Diamond Rogers had given him. So, it was bequeathed to him. Needless to say, the concept of putting a screen protector on a phone is a bit foreign to teenage males, and the phone spends the better part of its day travelling around in a jeans pocket. So, as you can guess, it got a bit scratched up. So we decided to give Displex a try to see what it could do with the screen. NOTE: The website suggests that this product should not be used on touch screen displays. That would effectively eliminate most of the Windows Phones/Smartphones/iPods/etc. out there. I decided to give it a try anyway, but please proceed at your own risk. Displex comes in a small 5g (0.175oz) tube as shown below. In the package I received from WirelessGround, it was placed in a bubble-wrap bag for protection. Figure 1: The Displex tube as it arrives from WirelessGround. Unfortunately, the tube didn't come with any instructions, except those printed on the opposite of the tube. Figure 2: Instructions for use in little, tiny letters on the other side of the tube. It's a little tough for older eyes like mine, but they also have a copy of these posted on the website. To prepare the tube for use you need to screw off the black cap, then gently cut off a small portion of the plastic nozzle. At the phone end of the project, they suggest you mask off the painted surface around the bezel to prevent taking off logos, etc. This is a good idea, since this is essentially an abrasive paste/polish. Figure 3: I used masking tape to protect the bezel around the display and make sure the polish didn't touch any of the painted logos, etc. outside of the screen display. 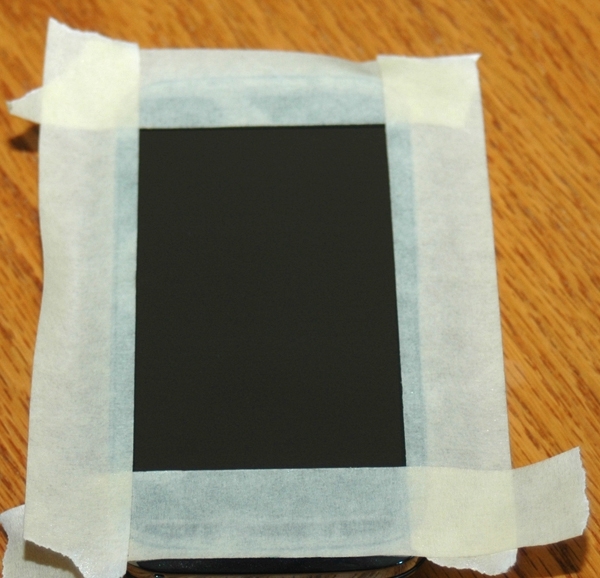 I proceeded as outlined in the instructions, squeezing a bit of the paste onto the screen, then gently rubbing with a soft cotton cloth for about 2 to 3 minutes, turning it frequently until the paste was removed -- much like polishing the car. On first application, I didn't see a lot of difference, so I tried another application. There was a small area with a deeper scratch, so I gave that area particular attention, pressing a bit harder and longer. After 2 or 3 applications this way, I still wasn't seeing a lot of change on the screen. So, I decided to try something stronger -- a paper towel and more paste than before. This seemed to work a bit better on the lighter scratches, but I wasn't able to remove them all. Generally, the screen looked better, but it wasn't completely pristeen as it had been originally out of the box. I may have been a bit spare with the polish paste, since after 4 applications, I had barely made a dent in the tube. According to WirelessGround, the tube should be good for 8 to 10 applications, and at my rate, I probably could have got 20! However, I didn't really think putting more paste on the screen would make that much difference. Unfortunately, I couldn't get good 'before and after' shots for you, since the scratches didn't show up on any of the photos I took. All in all, I was hoping for more significant results. Yes, the polish did clean up the lighter scratches in the display and generally gave it a very nice sheen -- similar to what it had when it first came out of the box. But it didn't make any significant difference with the more prominent scratches in the display which is what I was hoping to attack. If any of our readers have other suggestions or products they've used successfully, I'd be very interested in hearing about them. Maybe I am old fashion but I prefer a "Screen protector"; no scratches and also cheaper.